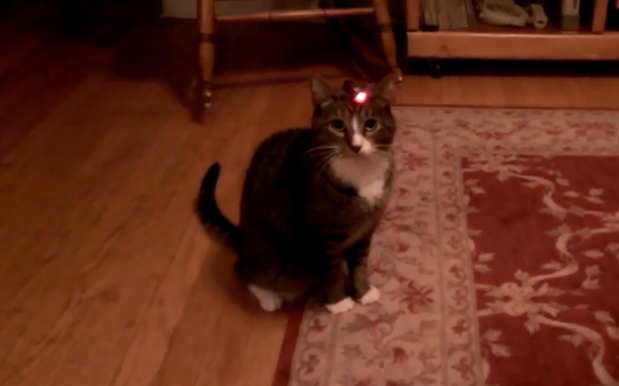 Man Tapes A Laser Pointer To His Cat's Head. Hilarity And Merriment Ensues! Because they are natural hunters, cats love laser pointers. According to Pet Adviser, the fast-moving red dot satisfies a cat's hunting instincts. For a lot of cat owners, a laser pointer is a must-have. There's much fun to be derived from seeing a kitten endlessly chase the red dot. This particular man got creative and decided to tape the laser pointer on his cat's head. The effect is hilarious. The confused look on the cat's face because of the perpetual presence of the fiery dot in front of him is priceless. However, before you start playing with lasers with your cat, there are some things you need to know. It might not be helpful to your cat. In fact, it might frustrate, confuse, and agitate your cat to the point that it will start acting aggressively against you or other cats. With that said, leave the lasers alone. There are other toys that you can give your cat to have fun with. If you have a pet dog, playing lasers on them can be harmful as well. As Healthy Pets points out, lasers can drive a dog nuts. Dogs can get very obsessed with chasing the laser light that they will develop behavior problems.